Alright so, as was stated, I’ve set out to get some healthy routines established before school starts again. Here’s the big disclaimer: I am basically new to this. Do I eat healthy and exercise? Yes, I generally eat healthy and yes I go to barre occasionally. Do I know how to properly julienne a bell pepper? No, not without a YouTube video at least. I’m going to assume most of you have your acts together much more than I do and I salute you. I’m also going to assume that some of you are on my level. 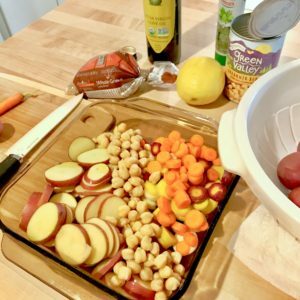 You know, the level where “adult” meals require having a recipe in front of you and you know realistically you’re adding at least 15 minutes onto that recipe’s estimated prep/cook time (because of the YouTubing). 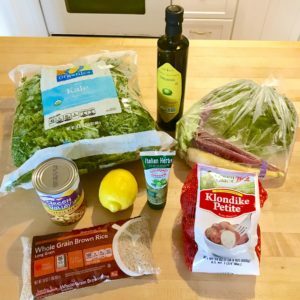 So here is a recipe that I found at Well and Full by Sarah. 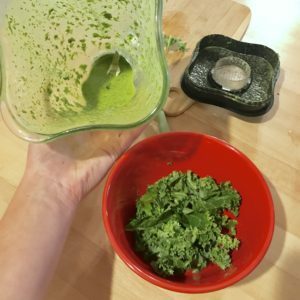 The recipe is great and probably simple for most, but below I’ll outline my experience with it, including some beginner tips. In a baking container of some sort, chop the potato and carrot into thin rounds. Throw the beans in there, coat everything with some olive oil, and pop it in the oven for 45-50 mins. Now you can put on the rice. Thank goodness the rice bag says the ratio of rice to water… but in case yours doesn’t, it’s 1 cup of rice to 2 cups of water. 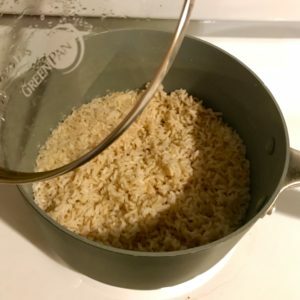 Let your water boil first, pour in the rice, give it a stir, and then put a lid on it with the heat at medium. It will be about 20-30 mins for the rice to plump. While that’s happening, you can make the dressing. Now the recipe says use a food processor… however I, as a pretend adult, do not have a food processor. Therefore, I did the research necessary to find that a regular blender will suffice. You stick the carrot tops (yes the tops) in, throw in some extra virgin olive oil, a little lemon juice, and some salt and pepper. Some tips – I added some Italian herb paste that I found at Vons™ and I pulled a lot of the greenery of the carrot tops off the stems just because it seemed like there were too many stems involved. 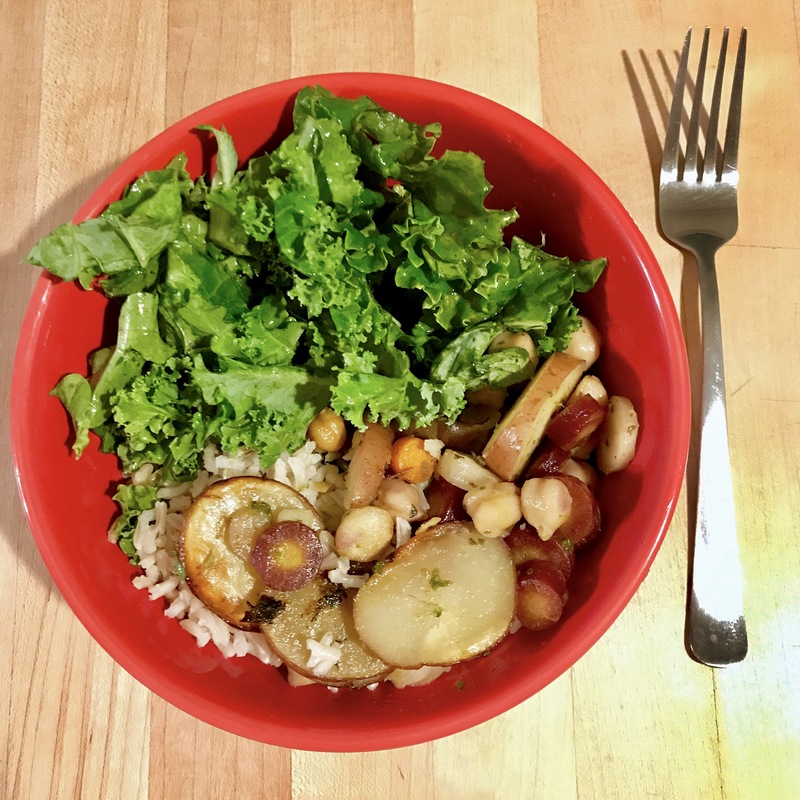 Hopefully your potato/carrot/garbanzo bean dish is roasted by now, your rice is cooked, and you’re ready to throw it all together!